We’ve made a recent interesting discovery with Mara. Lately when going in to get her in the morning from a nights sleep we have found her on her stomach. For this story, I guess that it helps to know that since birth Mara has always slept on her back, or at best on her side (her left is her favorite), so finding her on her stomach in the mornings provided some mystery. Was she rolling over in the morning then getting frustrated on her stomach and calling out for us to get her, or had she been secretly converting to a tummy sleeper during the night? Some nights when putting her down we would hear more than the usual whines, normally growing to a full out cry, then finding her on her stomach before falling asleep. Her crying made sense because she has never liked tummy time really. We would just turn her onto her back again to fall asleep. That set us on an experiment to see what the true answer was. Last night after being in the bed for a couple hours, Dad snuck in the room to see that Mara was sleeping on her stomach! We’re not sure if this is an every time occurance, but it seems that she enjoys sleeping either way now. One step closer to crawling it seems. So these pictures are a little old…maybe a few weeks. Amy & I took Mara and Zachary together on a walk in Adams Farm a few weeks ago. They had fun at the playground area there. It was the first time Mara had been in a swing alone before. On the first small push she seemed a little frightened but that quickly subsided as you can see here! This is a great picture of Zach on the slide…check out that hair. Last night we went to a local restaurant called Pastabilities. Great little place. Mara was having a good time sitting in a high chair like a big girl. 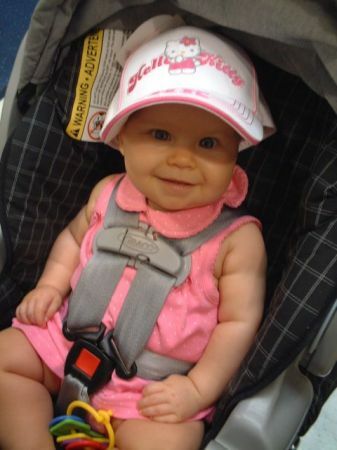 She had a bottle at home, but while Mom and Dad waited for food she had some baby food. When the food came she had a little of what Mom and Dad were eating, Mom with Shrimp Sho Nuf and Dad with The Big Easy. Dad’s was a little spicy. The sign was that Mara’s eyes started to get a little watery when she tried it. Mom had some shrimp in hers and Mara loved it. One funny thing, now that she eats table food, she always gives a little grimmace if you follow it up with some baby food. Even while eating she likes to keep her hands active by banging on the table or picking up things off the table. You have to be aware of the “Mara Exclusion Zone” when eating with her. After Mom and Dad polished off the bread, Mara began to eat the bread basket. 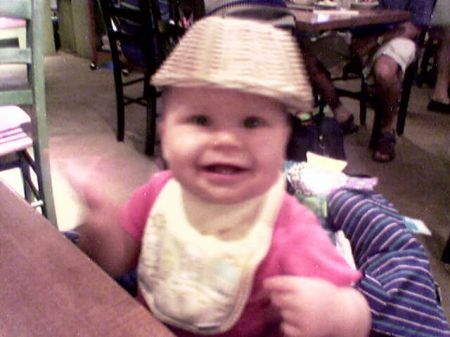 Here she is using the bread basket as a hat….. no, Dad put it there, but she enjoyed it! We did it again. We’ve stayed away from the blog a little while, sorry. We were off to the beach for a few days and away from the computer. To extend the issue, Dad went off on business right after the Sunday return and is only now able to get away for a moment to get a post up. Believe it or not this post is coordinated between Mom at home (uploading the pictures) and Dad in Helsinki, Finland (typing the post). 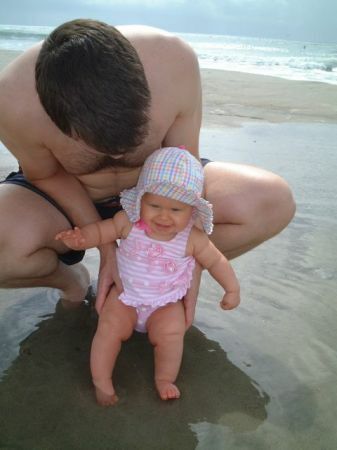 Anyways, this past weekend Mara got to travel to Emerald Isle for her second visit to the ocean. She was actually at the ocean one other time back on Memorial Day. 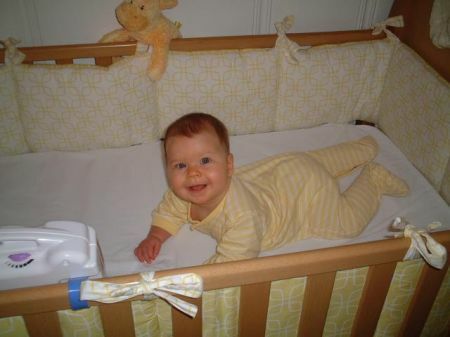 This was a little more experiential since she is now older. We can also put sunscreen on her so that means a little more sun exposure is OK. We stayed with two other families, one with 3 boys (Anton, Viktor, and Max) and one with 2 boys (Aidan and Pierce) so Mara was the only girl there. She held her own though. It was fun to see them all “playing” together and it was good because Mara doesn’t necessarily get to do that too often. She enjoyed watching all the boys and the attention she got. We got a bunch of pictures so we created a separate album for them and posted what we could. There are a few teaser pictures below, but click on any of them to be taken to the full album. We should also be able to post some video next week of the trip, but it is limited. The day we were going to take the beach footage was the day that Ophelia decided to make her presence known. She didn’t hit while we were there but she kicked up the surf and wind a notch by Saturday enough to keep Mara off the beach. Mom and me in the ocean… who knew waves hurt? I have been told a few times that Mara has had belly laughs and giggles, and I figure that I have heard something close to those things at times. But yesterday morning I initiated an activity with her that brought out a full giggle that was definitely the real thing. When Mom came out later I was able to repeat and show her too. We got to capture it on video for you to see. If you ever want to see a funny face, just give a baby a new food they haven’t tried yet. It doesn’t even have to be anything special like a sour lemon, although a lemon does work especially well. 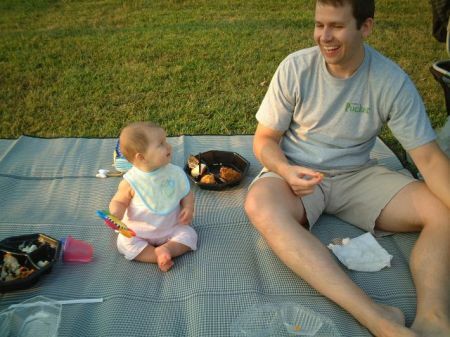 In this case last weekend we gave Mara Cheerios for the first time. Other than being a good food for her to eat, this exercise is supposed to help her to develop fine motor skills through the effort it takes her to pick up the Cheerios. At this point she is not very good at it. But still, an entertaining video and one of the first times she has eaten solid food and not baby food. Plus you get the bonus of snappy banter between two parents debating on the best way for a child to be served the Cheerios. Who could ask for anything more? 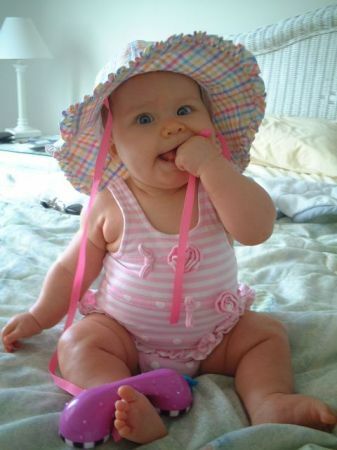 When we were visiting the Babies R Us the other day to find a bathing suit for Mara’s upcoming beach trip. We couldn’t find one but we did find this very cute hat instead. Knowing my sis likes some token tasteful Hello Kitty merchandise I thought she might get a kick of her niece sporting a H.K. hat in this picture!